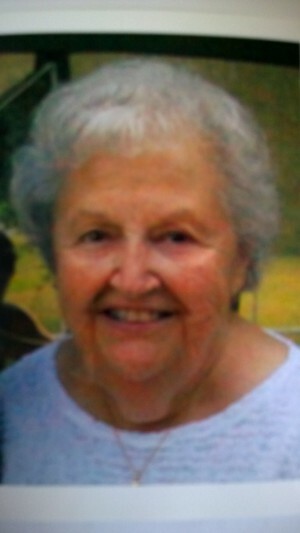 FULTON, NY – Elizabeth “Betty” Jane (Trepasso) St. Onge, 79, of Fulton, passed away peacefully Monday January 25, 2016, at Oswego Hospital, Oswego, NY. She was born to the late Gabriel and Jane (Mangano) Trepasso. Mrs. St. Onge had been a resident of Fulton all of her life. She retired in 1993 as a continuing property records coordinator from Alltel Telephone Co., Fulton, after 24 years of service. Mrs. St. Onge was a past communicant of Holy Family Church, Fulton, and a member of the Holy Family Altar Rosary Society and Golden Agers. She was a current communicant of Our Lady of Perpetual Help Church, Minetto, NY, and a member of Holy Trinity Golden Agers. Mrs. St. Onge was predeceased by her infant, son Steven Michael St. Onge, in 1966; and her brother, Anthony Trepasso. She is survived by her husband of 60 years, Francis St. Onge of Fulton; their four children: Deborah (Bob Siglin) Roehm of Endicott, NY, Lynne (Dave Chesbrough) Parkhurst of Oswego, NY. James (Debbie) St. Onge of St. Augustine, Fla., and Joseph (Kim Wood) St. Onge of Fulton; brother, Thomas (Barbara) Trepasso of Fulton; nine grandchildren: Andrew Parkhurst, Scott Roehm, Evan Roehm, Keith St. Onge, Steven St. Onge, Tanya LeMessurier, Danielle St. Onge, Desiree St. Onge and Marissa St. Onge; four step-grandsons: Joshua Martin, Jeremy Martin, Shaun Martin and Zachery Martin; 12 great-grandchildren; two step-great-grandchildren; and several nieces and nephews. Funeral services will be conducted 10 a.m. Friday at Our Lady of Perpetual Help Church, Minetto, where a Mass of Christian Burial will be celebrated by Rev. Robert Stephenson. Calling hours will be held Thursday from 4 to 7 p.m. at the Sugar Funeral Home, Inc., 224 W. Second St. S., Fulton. Contributions may be made to the American Cancer Society 6725 Lyons Street, PO Box 7 East Syracuse, NY 13057-0007 or the American Heart Association 2 Clinton Square Suite 305 Syracuse, NY 13202. Betty was a lovely lady and a devoted wife, mother, grandmother and great-grandmother, she will be missed for her contagious smile and warm heart. Thoughts and prayers to Fran and the entire family during this difficult time. A soul that is with God now will be missed however knowing that she is with God now bring comfort to us all. We are so sorry for your loss. Our thoughts and prayers are with Fran and his family. Rest in peace my sweet friend.